Let’s All Just Be Happy I Didn’t Teach Your Toddlers How To Play Craps And Use the F-Word. Shockingly, my best friend, Tracy and her husband, left me with their 1-year-old twins for the night. I know…I know…who do you call CPS on first? Ryan: How’s the babysitting? They’re down for the night, yes? Me: Sleeping like baby angels! Ryan: How many times have they checked in? Thank you for entrusting me with your two perfect babies. We are having a wonderful time. A few notes… First, you might notice that your son now calls you “Mummy” with a British accent. We apologize, Xavier thought it would be funny. Also, your other nephew, Liam has some concerns that my fake theatrical crying (when I stubbed my toe) might have made your daughter develop an ‘overdeveloped sense of schadenfreude’. His words, not mine. Lastly, I hope you don’t mind that your darlings now call raisins by their proper name…”Lies”. Ryan: Okay, two issues… First, what is your issue with raisins? Me: They’re the worst things that ever happened. Overstating? Ryan: But, they had those really cool commercials in the 80’s. They had merchandise! Me: If they were so great, they never would have had to sing and dance. The only reason chocolate advertises, is to keep you from buying OTHER chocolate. Me: What’s the other issue, you said there were two issues? Ryan: Oh, just that they’re never going to leave you alone with their children again. Now Would Be A Good Time To Try Atkins. When my mom left my brother with my aunt long time ago, she came back from her trip to see my brother walking like a monkey and with a shaved head except for a tiny ponytail. And my mom packed me dog food and a beer for lunch once. “Coincidentally” she also gave me lunch money that day. I think we turned out okay though haha. I don’t know. I might let you watch my kids just to see what happened next. Kind of like a reality TV show, without the cameras. A few years ago, we were hanging out in the lobby of a swanky hotel when we decided to teach my stepdaughter how to play poker. We use candy for chips. The other patrons were shocked by our parenting decisions. Dude, that’s a life skill, like changing a tire and knowing how to plunge a toilet. Drums…they need to play drums. I want to have babies just so you can babysit sometimes. I want everything about that EXCEPT being your labor coach. I know my limits. c’mon. how much fun would we have being labor coaches? we could be a team and just make fun and throw stuff at the women in pain while holding sticks with painkillers dangling on the end in front of them like carrots to horses. and we could dance and make them eat raisins. i think i’m onto something here. i’ll write the business plan. you design the cards. This is how I get thrown in jail. Almost positive. So funny. You should charge extra for enlightening those kiddos about raisins. I did it for free, because I owe the chick BIG TIME. Crap, pretty much think this means I still owe her, or owe her WAY more than I did. Damn it. When friends ask me to watch their kids I tell them “I managed to get three of my children to their teen years without incident!” They seem comforted by that until they remember I have two children at which point my daughter would chime in “we don’t talk about Pablo”. 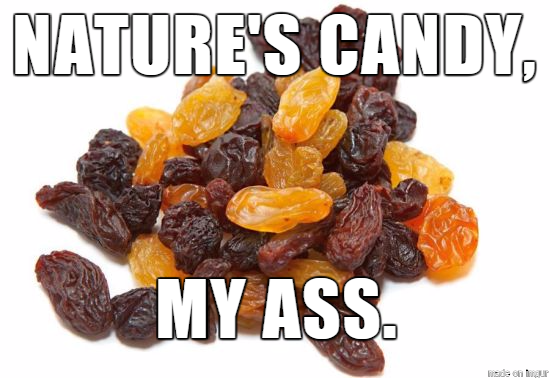 First, raisins are better than prunes. If you want to be regular, go with raisins… At least they have more sugar. Got him home, washed and combed his hair back into place and told him that I would show “mum” the pictures when they were developed. Keep up the fabulous work! \o/ The kids might love you for it, but the parents? Well, they forget how boring it was with adults. The only thing I got from that story is that you’re now my new babysitter. I’ll be over in the morning. Won’t work. I learned from the best… “Run and Scream Blue murder… You have permission, and ignore neighbors, they can’t (and won’t) do a thing…” I can exhaust even the most ADHD troubled child without a stitch of caffeine. Are you also able to handle the thought of your darlings cussing enough to make sailors blush and swear that would cause Priests and Nuns to faint from the horror? Make that and at least 10 different languages too… If you can, I’ll e-mail you my street address so you can dead drop them off. How great is it going to be when one twin speaks with a British accent and the other sounds plain American, Meg? TV contracts await! Your friends will love you. And when they cover them in chocolate? LITTLE HIDING BASTARDS. Oh no! Now that’s stuck in my brain! Damn.